Question? ?…..How would SAAB make a piston today?? 4032 Forged Aluminum alloy which is designed SPECIFICALLY for Two-Stroke engines! Saab OEM pistons (and many made today) were/are only made from poured mold cast aluminum. These are the weakest design made. 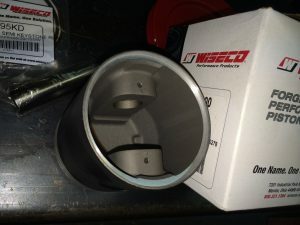 OEM Saab pistons got away with this by using quality Swedish tooling and aluminium. Not all steels and aluminum are made the same today!. Simply put, Saab made the best they could given the days technology. 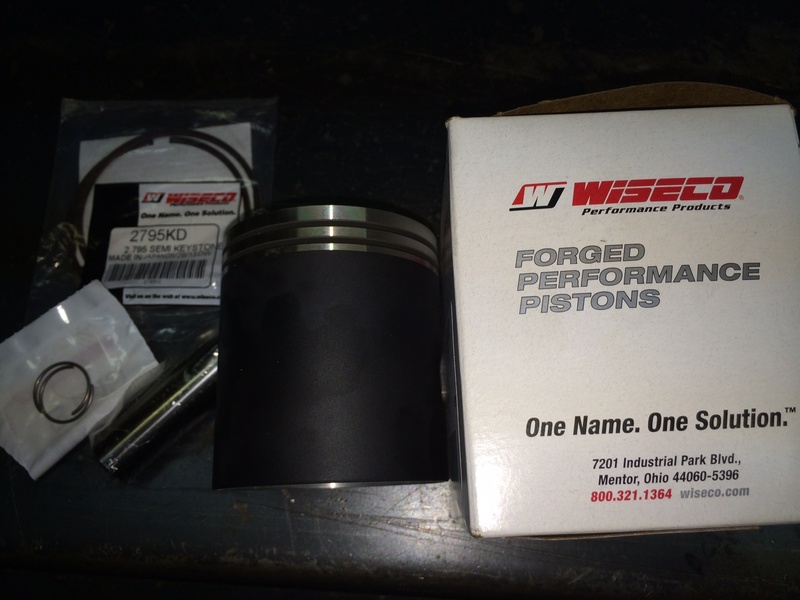 Now with today’s modern metallurgy come forged pistons. Where the aluminum is squeezed under extreme pressure to compress the molecules into a superior aluminum forged alloy for a more durable piston with higher heat tolerances (it cost more too which is why some companies still offer only cast pistons). NOTE: Myself and others have used Venolia forged pistons for years. Venolia uses a 2618 alloy which is designed specifically for FOUR STROKE ENGINES. 2618 alloy is still superior to cast pistons but are not as ideal as 4032 alloy forging are for two stroke engines. Dyno & real life experience show 2618 to be not as good for two stroke wrist pin boss, allowing wear in some cases. Also when 2618 experiences a heat event they just have no room for error. Enter the Wiseco 4032 alloy has a higher silicon content which is stronger and more resilient to heat. Fitted with two .060″ tapered piston rings in “Semi-Keystone” design. Why 2 thin Semi-keystone rings?? Saab OEM pistons use the old school THREE ring setup. These rings are usually .0997″ thick and are very heavy. These heavy rings can “flutter” (Flutter is when the ring floats in the ring land and loses it’s seal on the cylinder wall) on the ring lands under higher RPM’s (over 5,000 RPM’S) which allow hot exhaust gas to blow by the ring’s sidewall seal with the cylinder, which melts the thin layer of oil, which will destroy/melt a piston rapidly. In many of these cases you will read or think of the “melt down” as “detonation” but really it is most commonly caused by ring flutter. 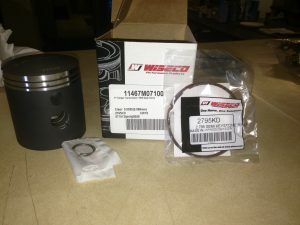 If you have ever seen an Original Saab 74mm piston you will notice it only uses 2 rings and they are thinner than stock at .0775″ thick. Saab knew even back then that High Performance and High RPM’s pistons had different ring needs! The Semi-Key Stone design means the rings are tapered on the top. This tapper lets the ring seal better because of the angle it is cut which allows the compression gases to push the ring outward in the cylinder wall and downward into the piston land…all in a more natural fashion. It also gives the ring more movement within the ring land, which aids in reducing carbon build-up on the lands. Remember “back in the day” you had to “de-carbon” an engine every now and then? This Semi-Keystone Tapered ring is the two stroke answer! These pistons have ArmorGlide™ Coating on the Skirts. They also have an Electra-Coating on the ring Grooves and wrist pin boss areas for added durability. The pictures below show what I believe to be the finest pistons ever produced for a Saab two stroke…ANY WHERE in the world!! …Demand the best for your rebuild! FORGED 4032 alloy Designed specifically for HP two stroke engine applications. Sizes from 70.0mm thru 74.5mm in .5mm increments! 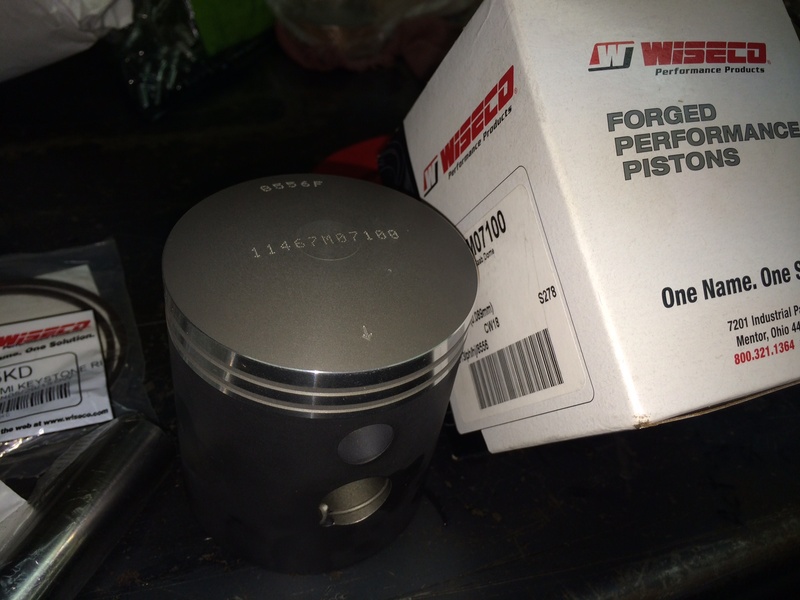 Piston retail price is $199 each or $597 per set. Replacement Keystone Rings retail price is $23 per set. Replacement 1mm Rings retail price is $26 per set.